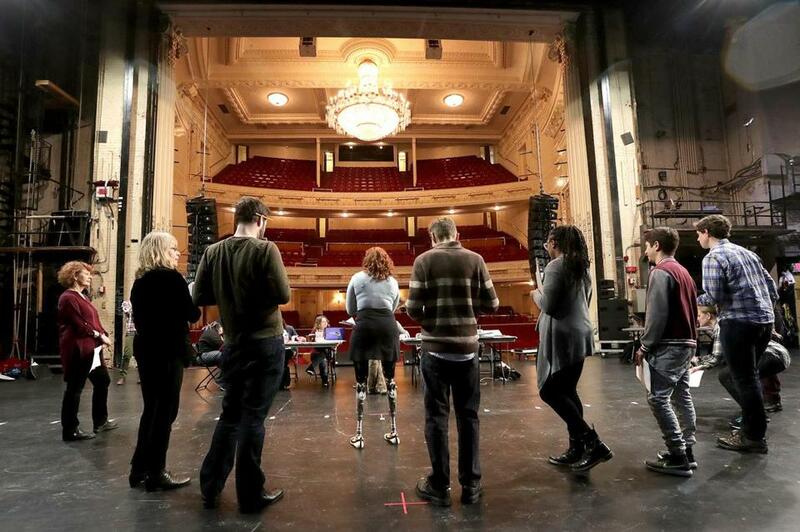 A rehearsal for “Finish Line” at the Shubert Theatre. On a typical morning, Joey Frangieh leaves his South End apartment and walks over to the Equinox fitness center in the Back Bay, where he trains for the Boston Marathon. After logging his miles on the treadmill, Frangieh then heads on foot to Tremont Street to prepare for the biggest moment of his young career. A year ago, Frangieh was running a fledgling nonprofit theater company out of his living room. Now, the 26-year-old is about to direct the world premiere of “Finish Line: A Documentary Play About the 2013 Boston Marathon,” at the Shubert Theatre. Thanks to a unique partnership between Frangieh’s Boston Theater Company and the Boch Center, the homegrown play with a cast of 11 actors is gaining wide exposure and a big stage. 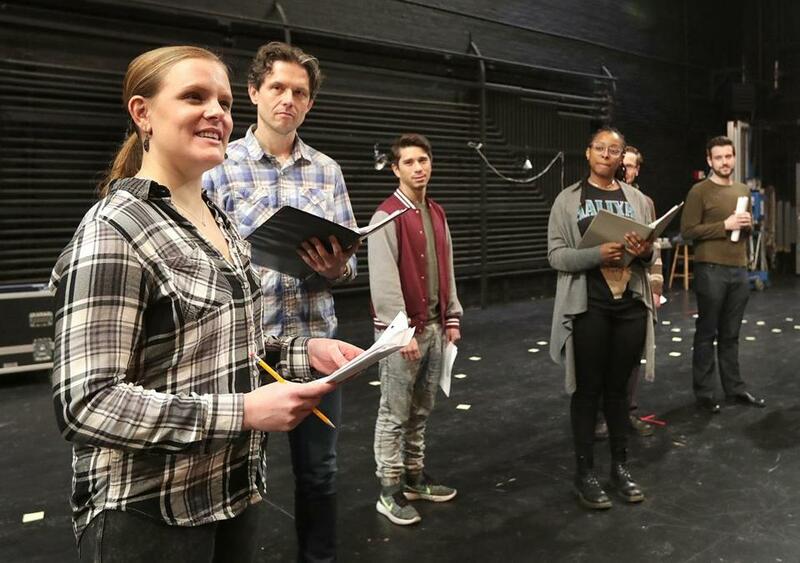 From left, Amie Lytle, Lewis D. Wheeler, Sam Tanabe, Tonasia Jones, Danny Bolton, and Greg Maraio, during a rehearsal of the play. Lisa Rafferty, who created the play with Frangieh, teaches theater at Bridgewater State University. After the two Boylston Street bombings on April 15, 2013, that killed three people and injured scores of others, Rafferty was wrestling with how to discuss the tragedy with her students. She picked up a textbook and flipped through the pages that she’d assigned the class to read, and turned to a section about documentary theater. It was a Eureka moment. “Documentary theater tells the story verbatim in the words of people who were there,” she says. The class was asked who should be in a play about the Boston Marathon bombings. Her students were quick to reply. First responders. Doctors. Runners. “That’s when it all started for me,” Rafferty says. Meanwhile, Frangieh was brainstorming on his own about ways to commemorate the heroes and survivors of the Marathon. And thus began a journey that would result in “Finish Line,” which opens at the Shubert Wednesday and runs through March 26. A portion of the ticket proceeds will benefit the Martin Richard Foundation, named for the 8-year-old Dorchester boy who was among the bombing victims. 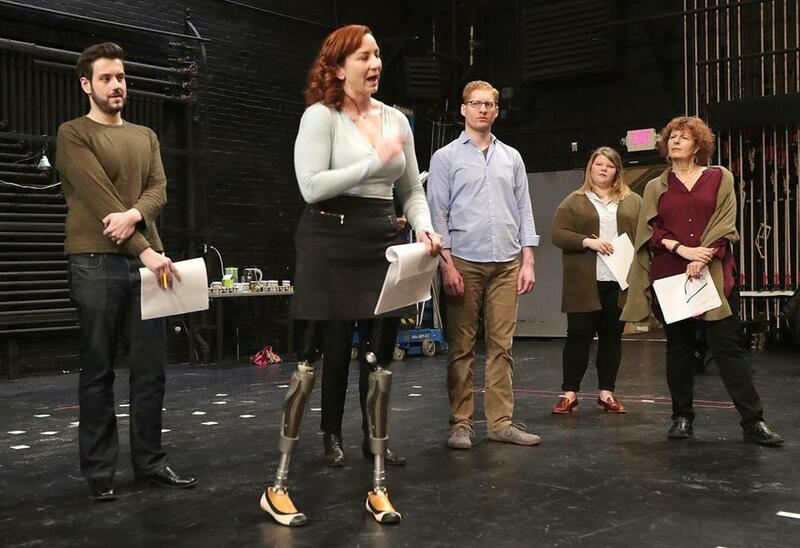 Ninety-four people who had been affected by the Marathon bombings agreed to sit down and share their personal stories for the production. In addition to runners and first responders, they included family members, spectators, journalists, and the city’s police commissioner. In some cases, friends of the interviewees recorded the conversations, which resulted in “really intimate interviews,” Frangieh says. Those recordings were then turned over to a team of 22 volunteers who transcribed the audio by hand, capturing every natural pause and “um” and “you know” along the way. “We ended up with thousands of pages of transcription,” Frangieh says. Frangieh, Rafferty, and Bridget Kathleen O’Leary, the production's dramaturg, pored over those pages and whittled the material down. Of all the interviewees, 14 became main characters in the play (some actors play more than one role), and their memories and experiences were woven together to create a singular, cohesive story. By splicing monologues and using split scenes, “Finish Line” isn’t just a succession of individual actors taking their turns to speak on the stage. At one point, they complete each other’s sentences. The scenery will consist only of light bulbs — more than a thousand of them. Frangieh noted how one small light bulb can light up a room, and hundreds can have an even more profound effect. Call it metaphorical illumination, if you will. Among the real-life characters portrayed in the play are Globe photographer John Tlumacki, who was at the finish line when the bombs went off; Maria Stephanos, a news anchor who was also at the scene; Dr. David R. King, an MGH surgeon who operated on bomb victims after he ran the Marathon; Police Commissioner William Evans; and Liz Norden, whose two sons were injured on that tragic day. Nine of the 11 cast members have local roots and will be familiar to Boston theater audiences, including Paula Plum, Ed Hoopman, Omar Robinson, Karen MacDonald, Greg Maraio, and Lewis Wheeler. Sullivan says that after the bombs went off, this doctor jumped a barricade, sprinted down an alley, and immediately began administering CPR and placing tourniquets on bleeding victims. “She leapt into action without any real regard for her own safety, and helped — along with many, many other people — helped save a lot of lives that day,” Sullivan says. Amie Lytle, a local actress who has been involved with “Finish Line” since the beginning, through early scripts and workshop productions, plays the role of Erika Brannock, a preschool teacher from Maryland who was at the finish line to cheer on her mother. Brannock spent more than seven weeks in the hospital and had to have one of her legs amputated. The actress is looking forward to meeting her at one of the Shubert performances. “She’s just a remarkable person,” Lytle says. After the 10-day run, the creators of “Finish Line” hope to bring the show to more audiences. Rafferty notes that there have been other terrorist attacks since the Marathon bombings — in San Bernardino, Calif., Orlando, and Paris — and that “Finish Line” is a story with universal themes that will resonate with many people. Frangieh says they might be able to take “Finish Line” on the road to other parts of the country, or broadcast it on television, or — who knows? — maybe even get it to Broadway. As long as someone is interested, he’s open to all of those possibilities. “My goal is to show this to as many people as I can,” he says. Emily Sweeney can be reached at esweeney@globe.com. Follow her on Twitter @emilysweeney.